We mourn the passing of Robin Williams at age 63. He was an extraordinary person who touched the lives of millions as a comedian and actor. Initial reports suggest that he took his own life. A spokesperson for the family say that he wrestled for much of his life with depression and addiction. His comedic genius served as a backdrop to my generation and touched the life of my children’s generation through endearing performances such as the Genie in the Disney animated film, ‘Aladdin’. 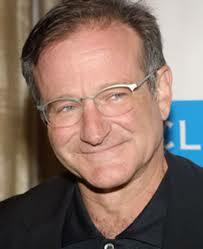 As an actor he won an academy award for his role as a grieving, empathetic therapist in ‘Goodwill Hunting’. In the film ‘Dead Poets Society’ he portrayed a beloved teacher who drew from his own reservoir of pain and spoke to the deepest longings of his students. Robin Williams portrayal of these two fragile characters rings true because we sense that he brought his own vulnerability to the role. His experience resonated with our own sense of vulnerability and struggle. As a comedian he had us rolling on the floor in laughter, even as we sensed that his comedic gift came from a fragile place. This connection between darkness and laughter wasn’t unique to Williams. His death feels so personal because his authenticity as a human being touched us deeply. Robin didn’t hide his struggles but put them out for all to see. My hope is that his example will encourage and challenge each of us to be honest about who we are. One truth I’ve learned in 30 plus years of being a pastor is that no one has their act completely together, certainly not me. We all have our areas of light and shadow, hope and despair. This mixed bag is what it means to be human. That Robin’s despair ultimately took his life should not discourage us from being open about our own vulnerability and struggles as well as our hopes and dreams. His example challenges us to respond to the seemingly polite question: ‘How are you today?’, with an honest answer: ‘I feel good, happy’. Or, ‘I feel alone/anxious/sad/hopeless/angry’. The truth is most of us feel a mix of emotions every day. In choosing to be emotionally authentic with each other, we have a responsibility to listen and be compassionate and caring. To let each other know that we have each other’s back. This is what it means to be part of a healthy community. This is a bittersweet time. We are full of grief at the passing of an immensely talented, flawed and courageous human being. And, we are full of gratitude for the joy and depth of humanity that Robin Williams brought to us all. May God’s comfort be with his family and all who grieve his passing. To the Creator’s love we return his expansive soul. As a police officer, I went to the scene of many suicides. I often wondered what went through their minds just before they chose to end it. If they could’ve seen the level of reaction to their death, with Williams being the extreme example, I wonder if they would act differently. I am of the school of William Hamilton, doubting the existence of God. Not because of the existence of evil, but just that it seems to be the simplest answer Occam’s razor as it were. Joe, thanks for reading and your comments. It is heartbreaking to see someone take their life because they see no room for hope. It leaves a painful wake that will stay with their family and friends for a lifetime. A reminder to take care of each other as best we can. Thanks for your encouragement on my writing. Congrats on walking the Appalachian Trail! He made me cry as often as laugh. A remarkable man. I am deeply saddened by this. So true Rob, he touched us all.